Returning to the Edinburgh International Film Festival, following the success of his standout documentary, The People Vs George Lucas, director Alexandre O Phillippe, turns his unique style of filmmaking towards the world’s most unlucky football pundit, an octopus named Paul, in this witty, funny and thought-provoking film, The Life and Times of Paul the Psychic Octopus. Beginning with the oddly moving scenes of Paul’s cremation, Phillippe’s film uses interviews with those closest to the mysterious cephalopod to create a portrait that says more about humanity and world culture, than it does about Paul’s infallible legacy. Filmed in locations across the globe, including the UK, Ireland, Italy, Spain, Russia and Paul’s former home at the Sea Life centre in Oberhausen, Germany, and featuring songs, films, animations inspired by Paul, the film delves into a number of issues ranging from the mathematical, the psychological, the philosophical, the mythological and the absurd. 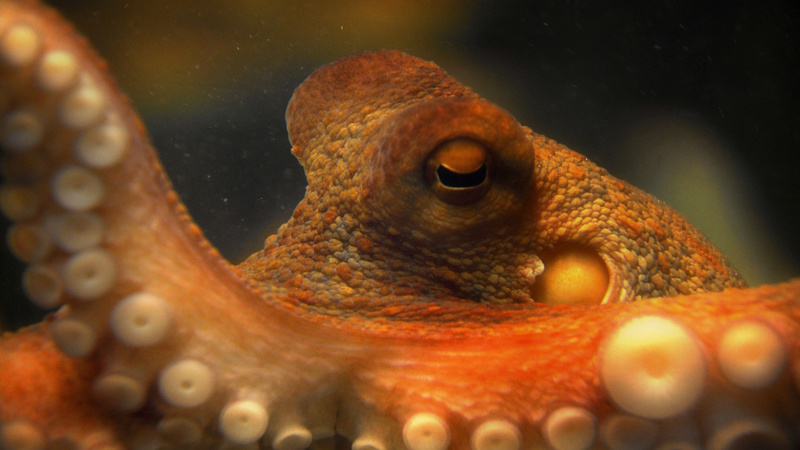 Like The People Vs George Lucas, Phillippe’s latest documentary, while impeccably researched and filmed, is very aware of its limitations; after all, just how much can you say about a supposedly psychic octopus? But what Philippe is concerned with is creating a film that presents all the sides of the story of Paul’s unique rise to fame, resulting in a piece that is well-rounded, philosophical, and at points, side achingly funny. From Paul having his own agent, to the ongoing debate about Paul’s official nationality, to a discussion about whether some animals are psychic, this film is as fulfilling as it is entertaining. While Paul’s position as a modern-day animal oracle is argued well, logic and numbers are also at play, as Paul’s chances of correctly guessing eight out of eight games at the 2010 World Cup are revealed to be 256 to one. A highlight of the festival this year, The Life and Times of Paul the Psychic Octopus is a surprisingly educational but ultimately cheeky new documentary. This review was originally published on Caledonian Mercury.